The season of love is officially upon us, and even singles who swear against dating apps may find themselves meandering down the Tinder route. With nothing to lose but your time, it’s all too easy to download the app, throw together a profile, and fall down the bottomless black hole of aimless swiping. Once you’ve spent some time in said bottomless black hole, you may begin to notice some interesting patterns. It starts to seem like every profile includes a tiger, a baby, a fish, or any combination of the three. These patterns have become recognized as Tinder stereotypes (though they tend to pop up on other online dating platforms as well). 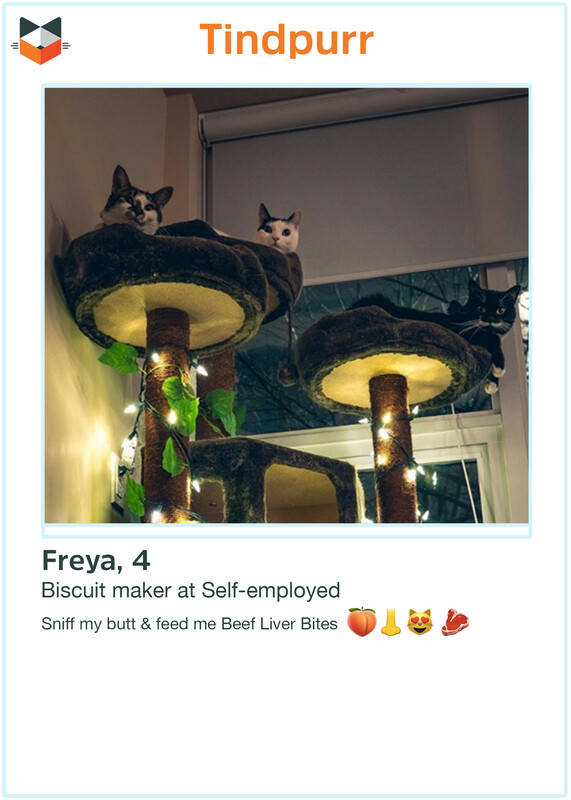 Since the majority of my Tinder ventures were witnessed by my very-judgmental cat, I naturally couldn’t help but to wonder: What would he think of this left-and-right-swiping business? 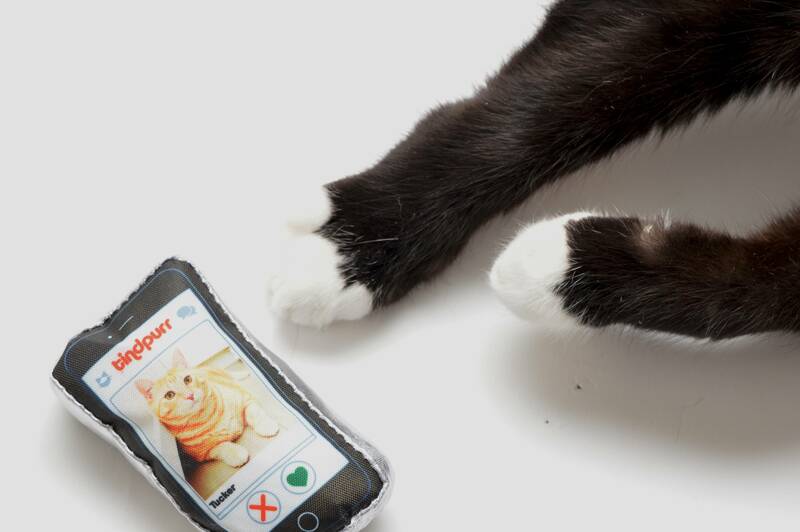 If cats took over the world, would they take over our dating apps? 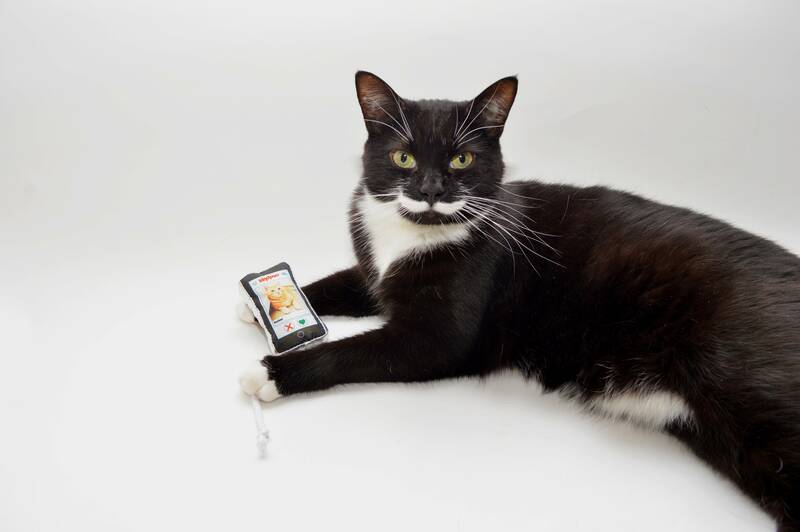 How would Tinder stereotypes translate from humans to our whiskered counterparts? 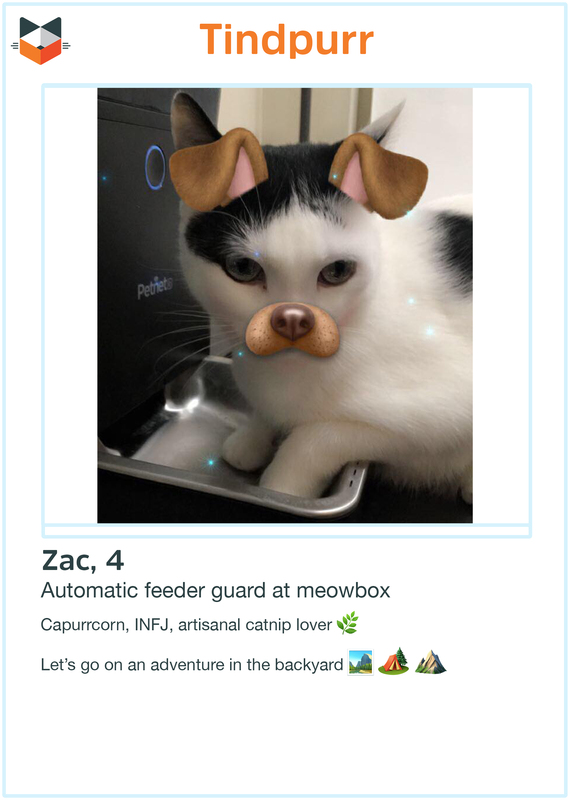 The dog filter suggests to Zac’s potential matches that, despite his passion for artisanal catnip, he doesn’t actually take himself too seriously. He’s a wanderer-at-heart who embraces every opportunity for adventure…even though his human refuses to let him leave the backyard. 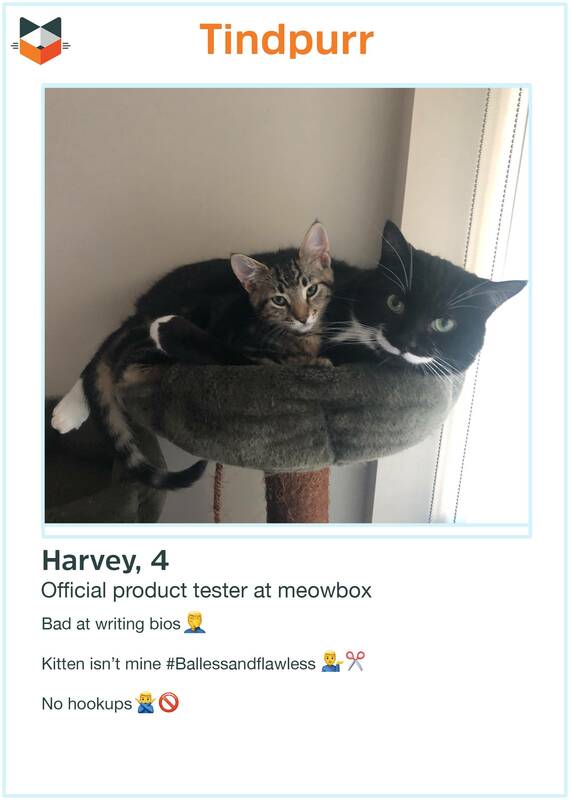 Harvey shows the ladies that even though he’s #Ballessandflawless, he’s also a softie who enjoys cuddling small, vulnerable foster kittens in his spare time. There’s more to him than just his parts (or lack thereof). He’s complicated. Sometimes, all of your most flattering photos happen to be group shots. While she could have cut out your clowder from the photo, purrhaps she’s intentionally striving for an air of mystery. Is Freya the dapper tuxedo? The doe-eyed cow cat? The pretty tabby? Plot twist: it doesn’t even matter, because all of these cuties are sending paws right-swiping. 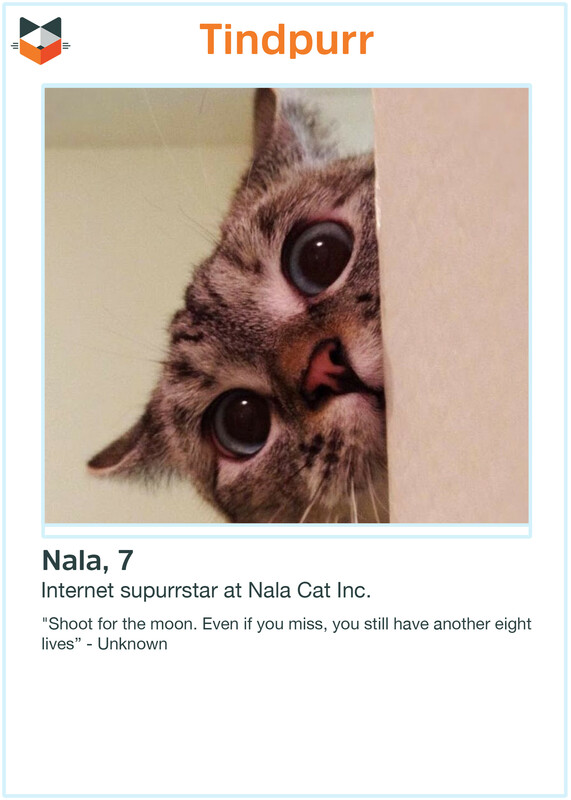 Most cats probably know that Instagram’s most famous feline is too busy headlining cat festivals and brushing the shins of Kevin Spacey to make a Tindpurr profile, but that won’t stop those catfishers from trying to fool the naïve. Even if Ralph can only chase the red dot for a total of five seconds before flopping onto the floor and demanding snacks, he must appear like he’s gearing up for an intense workout. In the land of Tindpurr—where first impressions are everything—being able to maintain an image is a crucial skill. 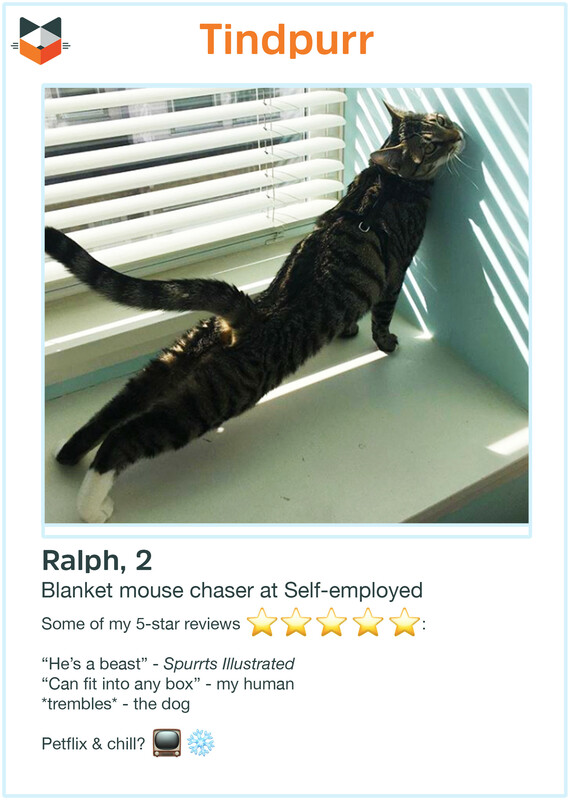 Which Tinder persona best captures your cat? Or would he prefer the more organic meowt-cute?